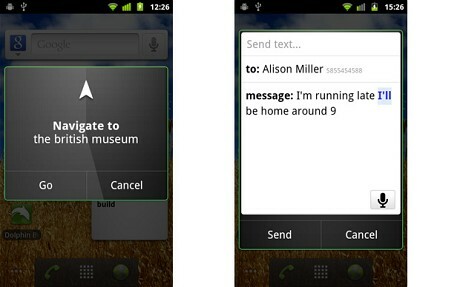 Fiddling with complex mobile phone menus and even typing itself could be a thing of the past, Google hopes. The search giant has launched â€™Voice Commandsâ€™ that will allow British customers to dictate entire messages or issue instructions such as â€œNavigate toâ€, so that phones can instantly supply driving directions and behave like satnavs. Some devices will even allow users to say â€œWake me up atâ€ to set the alarm clock. Although voice dialling has been available on mobile phones for a number of years, Google uses different technology to its predecessors. It turns each customerâ€™s voice into a file that it sends to the internet, and then compares the specific query to others it has collated online. By comparing the query to known, verified transcriptions, it can increase accuracy and also eliminate the need for users to train their mobile phones. Hugo Barra, Googleâ€™s product manager for mobile, said that by turning each voice command into what is effectively a search query, the company was able to build on its usual areas of expertise. Other voice commands that Google is introducing will let users dictate notes to their phones, navigate straight to websites, see maps and send email or text messages. If a user subscribes to an online music service, they can also say â€œListen toâ€ and then name an artist or album and immediately be connected to a relevant track. The service was previously available only to American users.